Northwest National Real Estate: Sold! Beautiful Western MT. Home! Sold! Beautiful Western MT. Home! House for sale on 11.35 acres located in Deborgia, Montana. End of road privacy. This beautiful home has cedar siding with a large covered deck and breezeway to garage. Inside the house there is an open kitchen/dining area, a loft with a bath and room for office or bonus room. Both the master bedroom and the mother in-law bedrooms have private baths. There is large pole barn building on the property with room for all your extra toys and a fenced area for horses or animals. 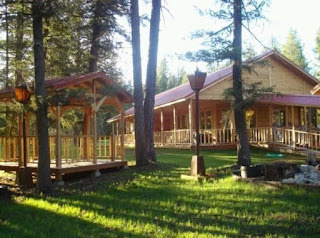 Live in western Montana in the heart of endless recreation; snowmobile, ATV riding, hiking, hunting and all recreational opportunities are just right out your door. Two minutes to Lookout ski area and the Hiawatha Trail. Contact Judy Stang at Spangler Real Estate (406)822-2316. Price reduced to $265,000.